Kitchen Area: The compact kitchen features sleek red gloss units with two ring hob, combination microwave oven, integrated dishwasher, integrated fridge with freezer compartment plus toaster and kettle. There’s also plenty of crockery, cutlery, glasses, saucepans and cooking utensils. Workspace: The table offers a useful workspace and folds out to make a dining table for four using the chairs provided. Living Area: Corner sofa which easily converts into a comfy double bed. Opposite there's new (in 2018) 32" HD Smart TV on an adjustable wall bracket with built in DVD player, free access to our Netflix account plus all the UK catch up and on demand channels. Sound is courtesy of a quality soundbar with Bluetooth connectivity for access to your own music devices. Bedroom Area: Hotel quality King size bed with cosy bedding, 4 pillows and storage drawers below. There’s also a useful walk-in wardrobe with shelves, hanging rail and chest of drawers. Shower room: This sleek hotel style shower room comes with corner shower cubicle, wash hand basin with drawers below as well as a heated towel rail and WC. We also provide complimentary Duck Island shower gel and liquid hand soap. Bits and Bobs: There is a laundry room with washing machine and tumble dryer just outside in the courtyard which is shared with Brighton Lanes Studio 2 next door. There’s also a secure bike rack behind the entrance gate for those wishing to explore Brighton from the top of a saddle. My husband Graeme and I run Brighton Lanes Apartments on Ship Street in the heart of Brighton’s lanes. We have four self catering apartments in total and have been welcoming guests since 2011. Fully integrated kitchen with 2 ring hob, combination microwave oven. fridge with freezer box, dishwasher, kettle & toaster. Plenty of cutlery, plates, mugs, glasses & cooking utensils. Great place to stay, stayed here before and never had a problem, easy to find and its in a great area with loads of local shops and near the beach, had everything i needed. So cute and cozy & In a perfect location! 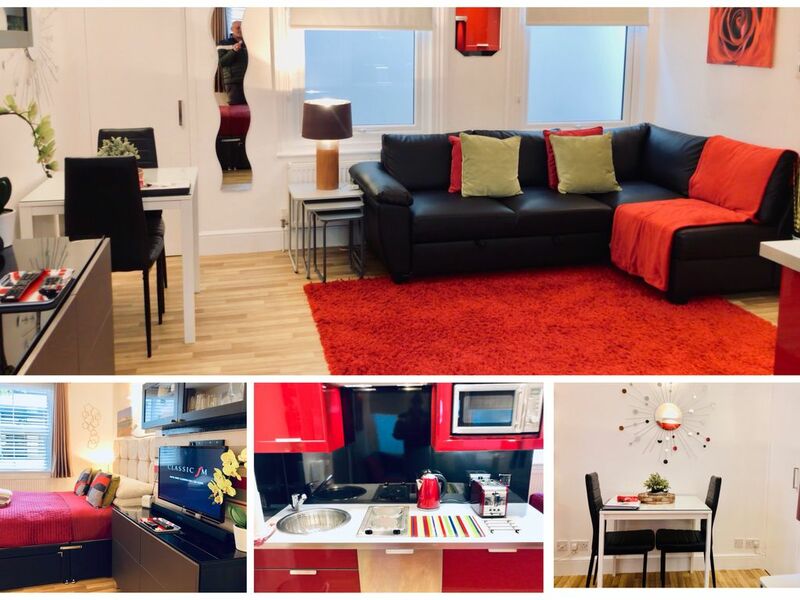 A beautiful apartment with everything you might need for a short stay. Great communications from the owner (James) and the fastest return of a damage deposit we've ever experienced. There was some late-night / early morning noise on Friday and Saturday but to be expected at such a central location. Would highly recommend. Thanks for such a great review Rosemary! A loveley staying at the Lanes.The property is clean.All you need is present. We had a talk to the partner of Mr.James.A very fine man. Very nice little studio apartment, so we'll designed. Everything you need for a comfy stay. Apartment was well located & as described was a rather noisy, however only on a Thursday & Friday night. Only negative for me was the quality of towels. Would have been better with more towels for 5 nights, although to be fair I could have washed them. Really nice holiday. Would recommend especially at the price. The location was perfect right in the heart of shops, restaurants and bars. The studio apartment was perfect for our needs and vert comfortable and warm. An excellent weekend.